Summer time means summer reading. While others are thumbing through the new E.L. James series, I am catching up on my hockey reading. 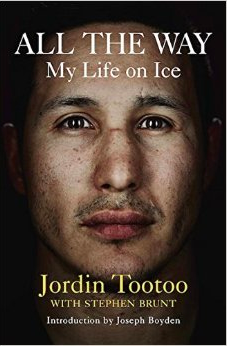 First up on the docket is Jordin Tootoo’s autobiography, All the Way: My life on ice. When the book hit shelves last year, Maclean’s magazine called All the Way, “the most compelling, honest and unputdownable hockey read in years” especially in comparison to other “predictable” hockey biographies that “have the feel of a Tim Hortons commercial, with less insight.” Did I find it honest? Absolutely. Was it “unputdownable”? Not exactly. 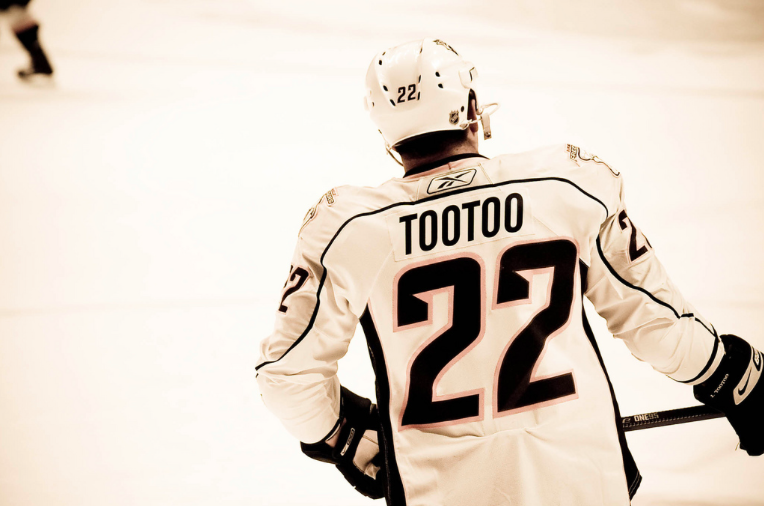 As an Inuk hockey player from the middle of nowhere, Tootoo’s voice is an important addition to hockey literature. It is an easy read that touches on some really important aspects of hockey but, for whatever reason, I found it lacking and often naive. Perhaps if Ken Dryden and “Toots” penned a book together that would make for written magic but, as it stands, I give All the Way 2.5 Netflix stars out of 5. I think the best way I can describe All the Way is catharsis. I give credit for Tootoo not pulling any punches – the drinking, the women, the abuse, the racism – it’s all there. First and foremost, I would consider this book a love letter to his late brother, Terrence. Tootoo is very open about his brother’s suicide, what they meant to each other, and how he dealt with life after his death. Toots refers to suicide as selfish and both his brother and late team mate (and road rookie), Wade Belak, are implicated in this “selfishness.” Second, All the Way speaks to the cycle of alcoholism and its effect on families. It all starts with his father’s drinking and then it trickles throughout the family. But it doesn’t stop there. Tootoo reveals the way that his drinking would affect his friends and their girlfriends because when Toots was home everyone would party like it was 1999 and then the girlfriends and wives would bare the brunt of the effects. Third, I think it reflects on the limitations of masculinity as it commonly understood. He refers to himself as a “man-whore” and to his conquests as “broads”. He talks about his tabloid-esque relationship with American Idol star, Kellie Pickler and how he came to be with his now wife, Jennifer. Toots explains that he used women to fill the emptiness of his life, the loneliness. But his “whoring around” started well before his brother’s suicide; it started as soon as he was valued as a hockey superstar. In this way, I think that Tootoo gives a naive pass to his treatment of women as acceptable “given the circumstances” (read: lack of parental supervision, money, booze, athlete status). Furthermore, Tootoo explains that in the North (of Canada), Aboriginal people aren’t used to sharing their emotions; you are meant to bottle everything up. While that might be true, I think he misses the fact that hockey culture doesn’t exactly encourage emotional sharing either. Thus, what may have started out as a “cultural difference” was further fostered by the very thing that has kept him going all these years. He talks about “manning up” with regard to his seemingly successful stint in rehab. “Manning up” has always referred to taking care of your business but, particularly in this case, “manning up” means asking for help and realizing that assistance doesn’t make one weak or effeminate. There are glimpses of these reflections but he never really says it outright, which I think would have helped elevate his message. I think the fact that he experienced more racism during his short time in the AHL than his 10’ish years in the NHL is an interesting reflection. It would be interesting to see if other players have this same feeling since there really is no difference in diversity between the AHL and the NHL. Moreover, I think we often forget that racism extends beyond black and white. Earlier this year, spectators at a minor league game poured beer on a group of Native American children and hurled racist insults at them while at a game in South Dakota. So clearly, it’s not just an AHL problem. I certainly applaud Tootoo for his candour and give him credit for what he has gone through. Like I said, his is an important voice in the whitestream world of hockey. And, while I wish he would/could have delved into issues of masculinity, fighting, and his use of Ambien with more reflection, I realize that is asking a lot of a professional hockey player. Yet, perhaps this is exactly the problem – we don’t ask much of our athletes beyond the rink, field, or court. As Toots reasoned in the book time and time again: whatever he did off the ice didn’t matter so long as he performed on the ice. I haven’t really followed his career closely but it seems like he is a stand up guy now, but are these the kind of young men and women we want to be raising? Because, as we learn from All the Way, not everyone gets the privilege of making it to the point of catharsis.